Meet Winston, a large Galapagos tortoise with a small “2b” painted on his shell. Does his face look familiar? Though you may not have met him in person, the first time you saw his likeness was probably in 1982, or whenever you finally watched the Spielberg film classic E.T. According to the zoo volunteer who was more than happy to talk to us about the large collection of Galapagos tortoises often overlooked by your average zoo-goer, Winston’s face was the model for E.T.’s face. Occasionally a goody package arrives at the zoo from Spielberg addressed to Winston. I don’t know if Winston retains rights to some royalties or if Spielberg is just eternally grateful for Winston’s contribution. If it’s the former, the Spielberg estate may just be sending packages for a century, considering how long these tortoises live. He’ll probably be fit enough to attend a one-hundred anniversary celebration of the film, if anyone alive can recall that he played a part. The face of E.T., though I think the artists omitted the ever-present foam around the eyes and bits of breakfast. 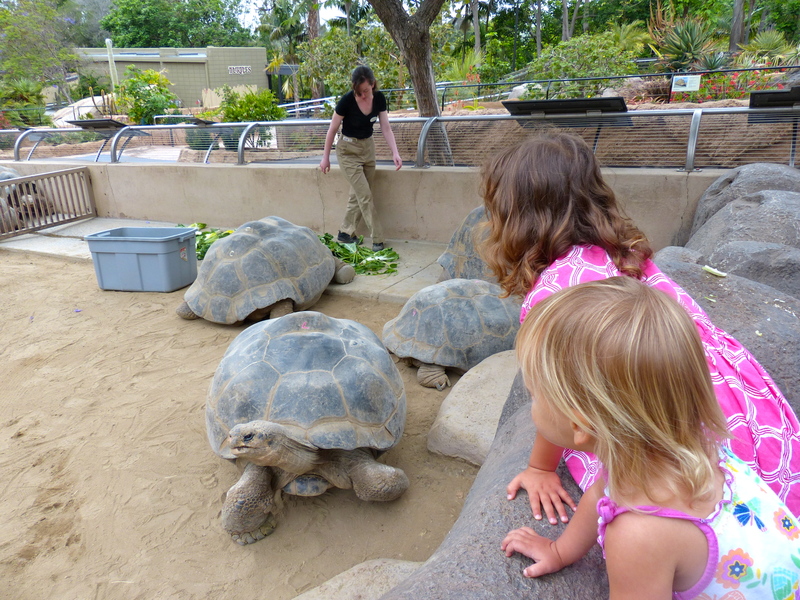 At the San Diego zoo, the Galapagos tortoises are kept in three separate enclosures, divided by species. (Each island has a different species). Winston is in the middle enclosure that contains the most tortoises. You’re most likely to catch a glimpse of his famous visage in the morning, just as the zoo opens and he is anxiously awaiting his breakfast salad. Later in the day he is more likely to be found resting in the sun as his food digests, far away from the short viewing walls. 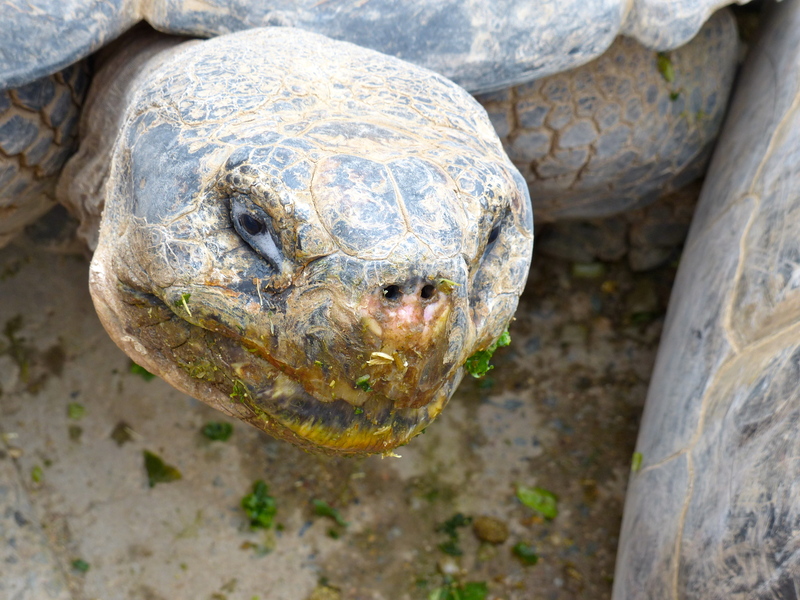 Visitors ages 5 and over who arrive at the tortoise enclosure at 9am, just as the zoo opens, may have an opportunity to pet a tortoise during feeding time. The zookeeper allowed my daughters to enter the feeding area but, because they are under five, they were not allowed to touch the tortoises. Nevertheless, they loved the closer look and the opportunity to ask numerous questions directly to the zookeeper.